Borneo Nature Foundation was created in 2016, born out of the Orangutan Tropical Peatland Project by its founders and directors who wanted to expand the reach and scope of the project and tackle conservation problems across Borneo. BNF’s origins go back more than 20 years to a series of university expeditions to the then little-known peat-swamp forest of the Sabangau River in Central Kalimantan. 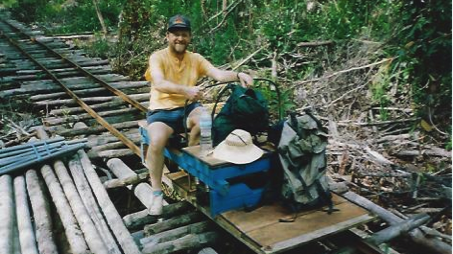 In the early 1990’s, botanists Jack Rieley (University of Nottingham) and Susan Page (University of Leicester), developed an interest in the ecology of tropical peatland ecosystems. 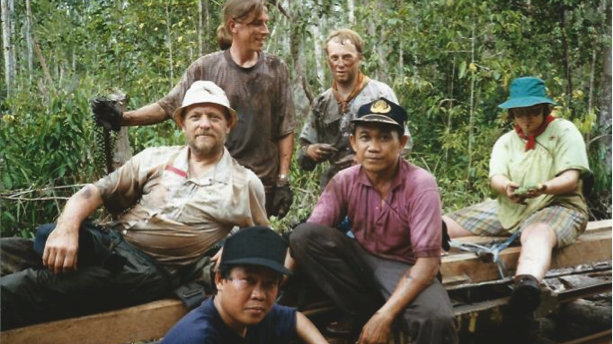 They teamed up with Suwido Limin and colleagues at the University of Palangka Raya to conduct fact-finding expeditions into the Sabangau Forest. During four summers, from 1993 to 1996, they took students into the forest for a few weeks at a time to measure trees, collect peat-cores and build a species list – studies that have been compiled into the most comprehensive understanding of this habitat-type ever collected and which kick-started global interest in the importance of protecting tropical peatlands. It was the drive and dedication of Dr Limin and Professors Rieley and Page that made the rest of this story possible. 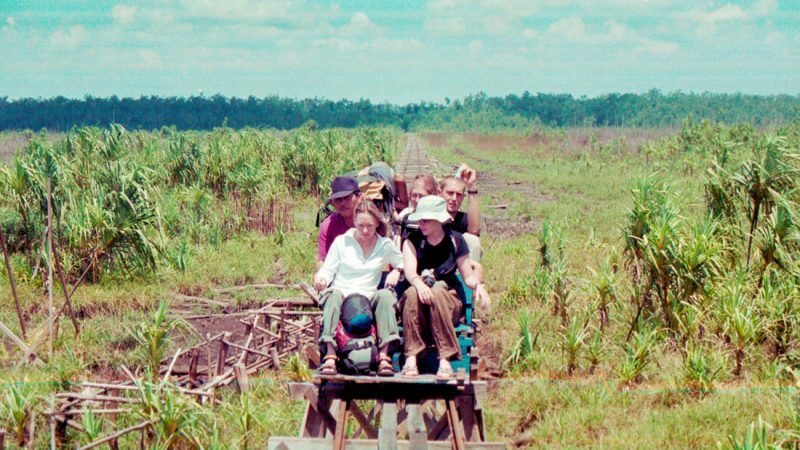 In 1995, Helen Morrogh-Bernard and Simon Husson, then zoology undergraduates, joined the third expedition and undertook the very first orangutan surveys in Sabangau. Incredibly, they discovered that this forest was the largest orangutan population in lowland Borneo, but the situation was bleak. 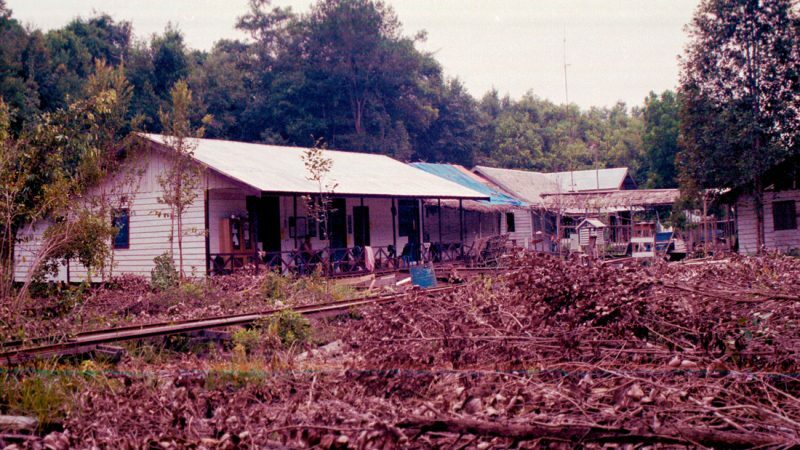 Illegal loggers were cutting down trees all over Sabangau, the peatland was being drained, animals were hunted, and a year earlier the first major forest fires in Sabangau destroyed over 10% of the forest area. 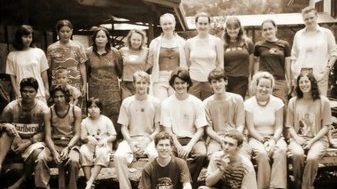 There was a serious threat of the region being developed and converted to agriculture or plantation, and so OuTrop was founded by Helen and Simon in 1999 with the aim to raise awareness of the importance of Sabangau for orangutan conservation and to encourage sustainable management, protection and restoration of this vital habitat. We surveyed orangutans across this vast landscape, documented rampant illegal logging, and brought this to international attention. With our urging and support, WWF initiated an orangutan conservation programme here in 2002, resulting in the designation of the Sabangau National Park in October 2004. 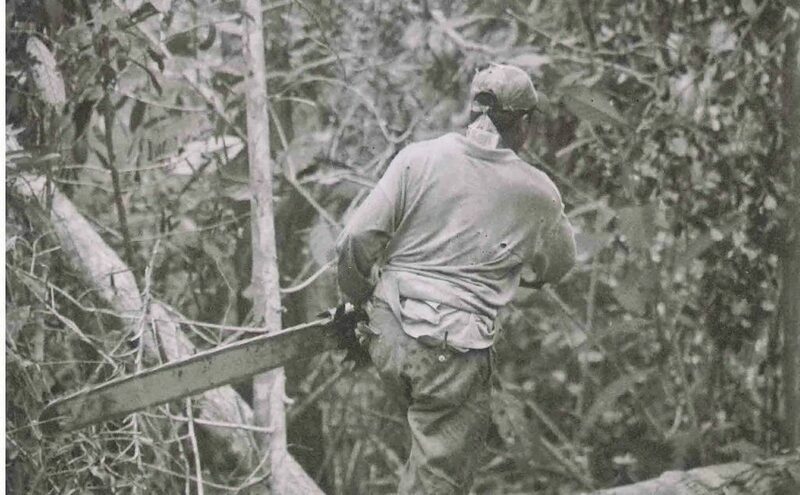 Since then we have supported habitat protection units and fire-fighting teams, carried out hydrology restoration and replanting projects, and brought over 300 research students and volunteers to Sabangau, working out of the same base-camp that was our home back in the early expeditions, although at that time it was mainly a logging camp. Our research focus has expanded over the years to take on dedicated projects on white-bearded gibbons, clouded leopards, red langur monkeys, forestry and biodiversity monitoring, among many others, and our team of scientists and field assistants has grown as well. Throughout OuTrop’s existence our long-term partner in Indonesia has been Dr Suwido Limin and his NGO CIMTROP (the Centre for International Cooperation for the Sustainable Management of Tropical Peatland) at the University of Palangka Raya. Suwido Limin was dedicated to protecting Kalimantan’s natural forests, by and for the indigenous people of Borneo who rely upon the forest for food, medicine, timber and for its special place in their culture and rituals. Following Dr Limin’s sad passing in June 2016 we are committed to continuing and building upon his legacy in Sabangau. By late-2015, OuTrop’s scientists were engaged in projects on many species across different habitats and locations in Borneo, undertaking surveys, collaborating with other organisations, and applying our expertise to a whole range of conservation problems. When two major new initiatives presented themselves, in the forests of the lowland Rungan River forest and the upland Barito Ulu, the directors of OuTrop decided that this was the right time to move the organisation forward. The Borneo Nature Foundation was created as an Indonesian not-for-profit, encompassing the existing OuTrop programme and the new Rungan River and Barito Ulu programmes, and joining forces with new strategic partners at each site. We are excited to begin this new chapter in our evolving story.